Showing items in category Penrhyn Island, sorted by newest listed first. PENRHYN - 1945 2/7d rate registered cover to New Zealand. 1945 (MY.30.) 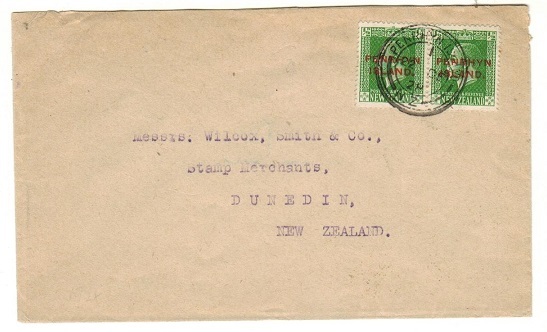 registered cover addressed to New Zealand bearing 4d and 2/- adhesives tied in combination with 3d black surcharge on 1 1/2d tied by PENRHYN ISLAND/COOK ISLANDS cds. PENRHYN - 1942 1/10d rate (un-censored) cover to UK. 1942 (AU.4.) 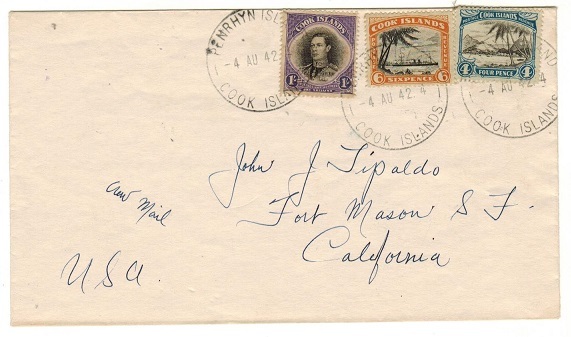 cover addressed to USA bearing 4d, 6d and 1/- adhesives tied PENRHYN ISLAND/ COOK ISLANDS. Sent air mail and uncensored. PENRHYN - 1935 6d rate registered cover to UK. PENRYHN - 1928 1d rate cover to New Zealand. 1928 (DE.22.) 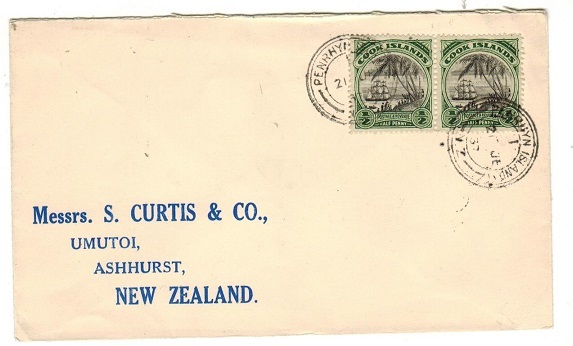 cover addressed to New Zealand bearing New Zealand 1/2d green pair overprinted PENRHYN ISLAND in red and tied by PENRHYN ISLAND/NZ cds with '1' coding. 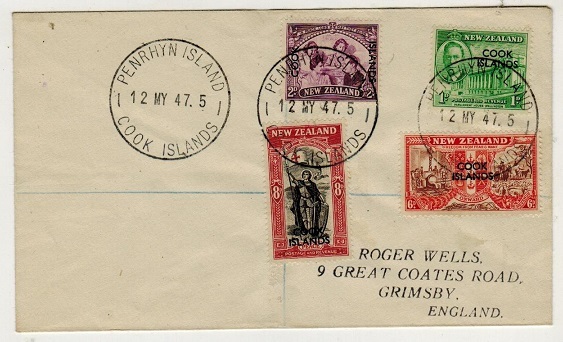 PENRYHN - 1937 1/2d Cook Island pair tied on cover to New Zealand by PENRYHN ISLAND cds. 1937 (JE.21.) 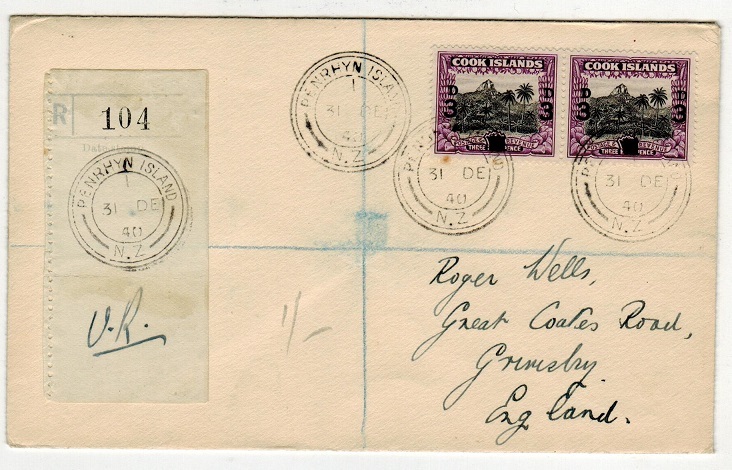 cover addressed to New Zealand bearing Cook Island 1/2d 'pictorial' pair tied by PENRHYN ISLAND cds's. PENRHYN - 1947 cover addressed to UK bearing Cook Island 'Peace' set of four tied PENRHYN ISLAND. 1947 (MY.12.) 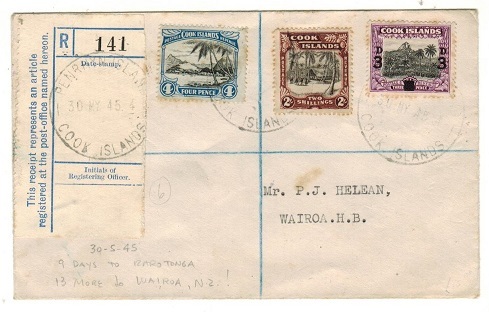 cover addressed to UK bearing Cook Island 'Peace' set of four (SG 146-49) tied PENRHYN ISLAND. PENRHYN - 1940 3d on 1 1/2d surcharge pair on registered cover to UK. 1940 (DE.31.) 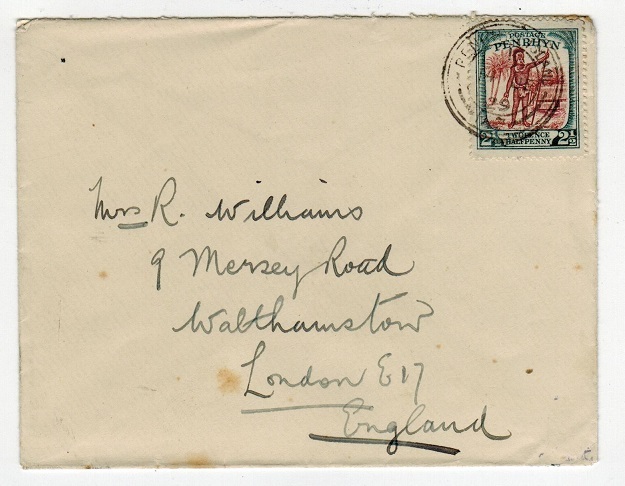 registered (Wells) cover addressed to UK bearing 3d on 1 1/2d surcharge pair (SG 130) tied by PENRHYN ISLAND/N.Z. cds's. PENRHYN - 1920 1/- IMPERFORATE PLATE PROOF vertical pair. (SG 37). 1920 1/- IMPERFORATE PLATE PROOF veritical pair printed in the issued colours of black and slate blue (SG 37) on ungummed paper. 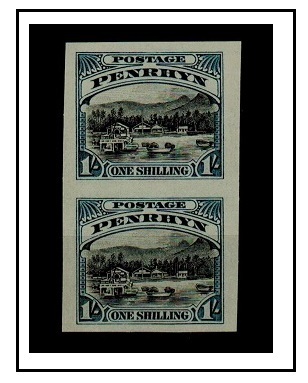 PENRHYN - 1920 3d IMPERFORATE PLATE PROOF with variety PRINTED ON THE GUM SIDE. (SG type 12). 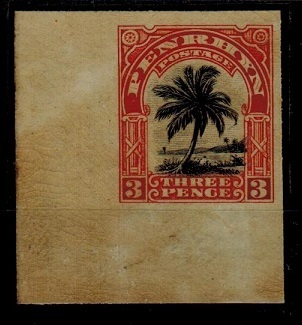 1920 3d IMPERFORATE PLATE PROOF in a fine corner marginal example (SG type 12) printed in the issued colours of black & red & showing the major variety PRINTED ON THE GUM SIDE. PENRHYN - 1929 2 1/2d rate cover to UK used at PENRHYN. 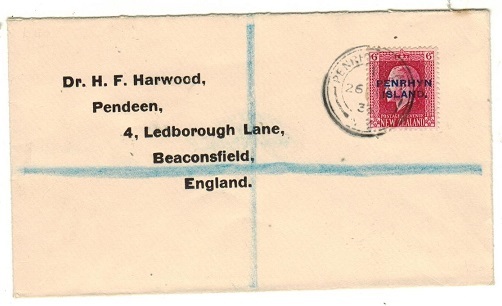 1929 (JE.5) cover to UK bearing 2 1/2d (SG 40) tied by PENRHYN cds.